When Shon and I first decorated Parker’s nursery the August before she was born, we didn’t know if we’d be the proud parents of a boy or a girl. We didn’t know until the day she was born – this was the way we wanted it. 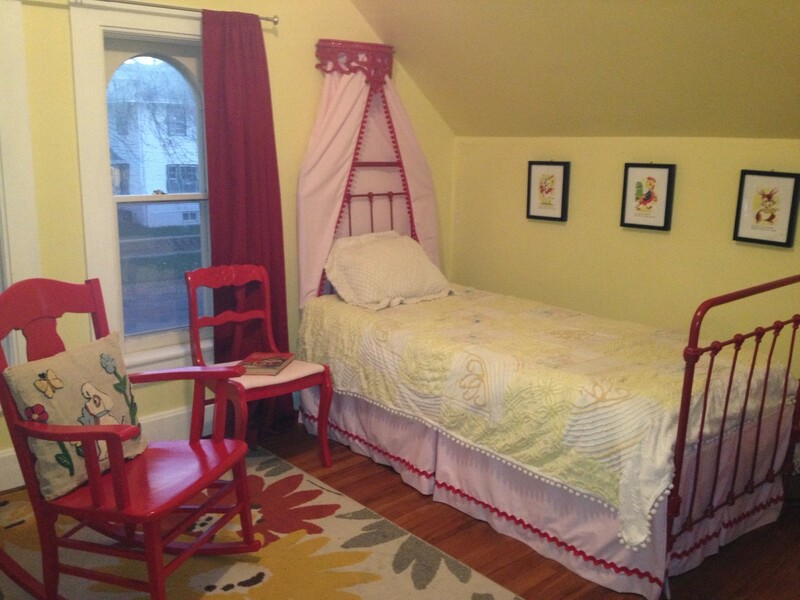 So, we kept the decor rather neutral – vintage children’s playing cards reprinted to 5×7 works of art decorated the light yellow walls and all the furnishings were painted a high gloss red. Today, our little girl is 3-and-a-half, and I felt like the transition from nursery to little girl’s room was never complete. So with a little more red, high gloss paint, and some AMAZING fabrics, I think it’s made the transition. 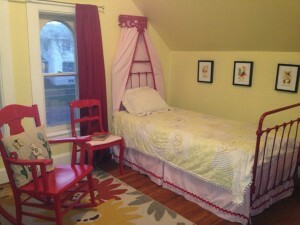 The quilt is made from two $5 chenille quilts I found at a flea market. They were both full of holes, so I cut the squares to avoid the holes and pieced together the quilt and edged it with white pom poms. 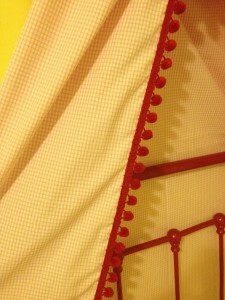 The accent fabric is white and light pink shirt fabric – it was amazing to work with and the red pom poms and rick-a-rack really pulls everything together. I found the wooden “crown” piece at a yard sale for just a few bucks. I love how it all turned out and so does she!